In more work-related news, I thought I’d share an activity our school did for Earth Day this year. Below is what I wrote when I nominated them for an award that is being given out by volunteers in PC Ukraine’s Environmental Working Group. I don’t know that we did anything award-winning, but it was pretty interesting! Students line up in three teams to prepare for the Earth Day competition. “My lyceum had a very unique way to celebrate Earth Day this year, which is why I’d like to nominate them for the Earth Day Network Environmental Award. On April 21st, three teams of students (about 40 total) competed in an “igra-quest” (игра-квест: game-quest) competition. The competition consisted of a scavenger hunt around town. When each team arrived at a destination, they had to complete a task before receiving the clue to send them on to their next location and task. The tasks included composing a poem about Earth Day, making an art composition out of trash, sidewalk drawing with chalk, and picking up trash from a designated part of town (in the park, near a cafe/bar, behind the house of culture). Additionally, each team of students came up with a little chant/cheer and all wore green ribbons or paper designs in honor of Earth Day. At the end, awards were given to the “fastest” team, “most creative” team, and “most active” team. Class ОКН-КС 2/9 writes their Earth Day poem. My school has done a number of igra-quests, as well as some geocaching competitions. The geocaching games are similar, except that each task point is programmed into a GPS receiver. (Borrowed from a UN organization located in a nearby city.) The teams use the receivers to locate each point. The students really enjoy these activities. There’s definitely potential for some sort of geocaching club next year; maybe I’ll even write a grant for us to buy our own GPS receivers. 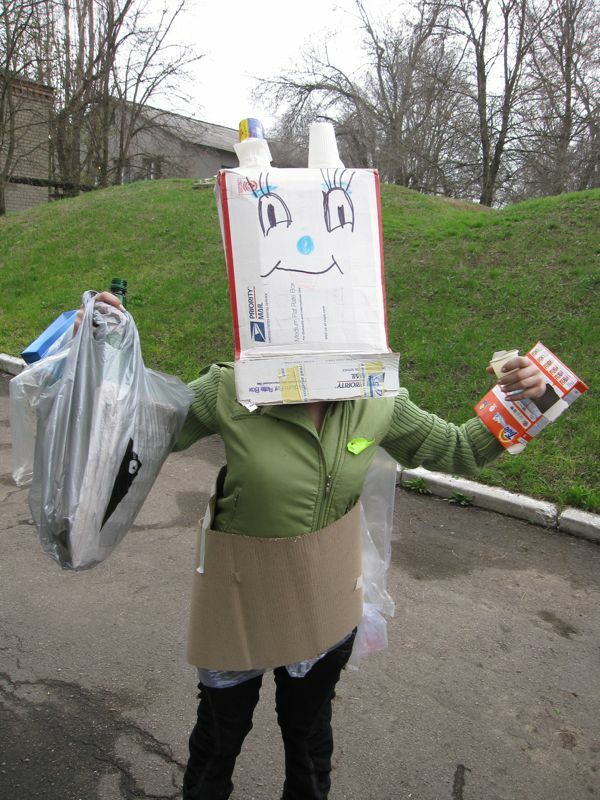 Vita shows off the "living art composition" made out of trash by Class ОКН-КС 2/9. Class ОКН-КС 2/9 filled up their large bag with trash collected from behind a local cafe/bar. I didn’t realize it had been a week since I’d checked out your web site. Loved reading all about the happenings in Ukraine, keep up the good work!